We have regularly reminded you that we are experiencing a snowy and cold winter. Many people think that means a long and boring season. Robbie has been staying in GriggsDakota this winter. He doesn't sit around very often and has not been bored. Robbie is now a qualified teacher, but is also taking a few online classes that will expand his teaching license to include junior high. Most days he is on the go. Robbie has been the assistant boys coach at an area high school this winter. He started coaching while in college and last year was the assistant coach of the Jamestown Womens Basketball team. 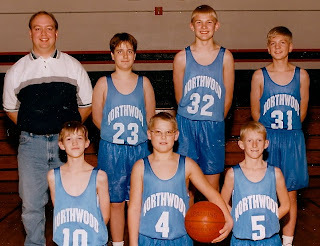 He was in charge of their Junior Varsity and assisted with the Varsity. Basketball is his favorite sport. He works under an experienced coach that Robbie knew could teach him many lessons. 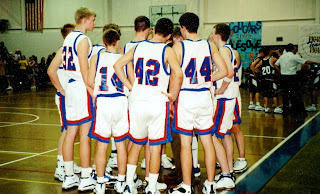 Robbie acted as the head coach of the junior varsity team and C squad. He learned a lot by listening and really enjoyed getting to know the team. Robbie substitute teaches at area schools and has left in the morning darkness through the winter. Or practices for his sister's wedding on the Fender. Better to be busy than bored. But like the rest of us in GriggsDakota, he's looking forward to Spring and work on the farm. I can think back to when Robbie was just a cute little white haired boy who would love to sit in tractor for hours. Now he is all grown up. Time flies. Those kids will be lucky to have such a wonderful teacher and coach.